Distemper – Otherwise known as “hard pad disease” because of the way the disease can affect the pads of a dog’s feet, distemper is a virus that attacks the tonsils and lymph nodes before moving throughout the rest of the body. Cold-like symptoms progress into coughing, vomiting, and diarrhea before disease ends up in the central nervous system, causing seizures and hysteria. Distemper can be deadly, especially in dogs with weakened immune systems. Parainfluenza – You might think your dog has a simple case of kennel cough, only to find that he’s actually contracted highly contagious parainfluenza. This disease, transferred through nasal discharge, affects the upper respiratory system and can lead to other, more serious conditions. Hepatitis – An infection of the liver, hepatitis causes depression, loss of appetite, coughing, and potentially jaundice and vomiting. In the worst cases, resulting cirrhosis and liver failure can be fatal. The underlying cause is often unclear, complicating treatment of the disease, especially when it becomes chronic. Parvovirus – This disease, spread through contact with feces, wasn’t detected until the 1970s. It is very hard on the immune system, causing vomiting, diarrhea, and rapid dehydration. 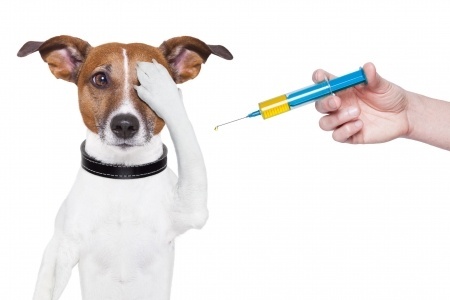 Rabies – This is the only vaccination that is required by Virginia state law, mainly because of the effect it can have on humans. Transmitted by the bite of a carrier of the disease, rabies attacks the central nervous system, causing behavioral changes and eventual paralysis. Rabies is extremely deadly in unvaccinated animals.